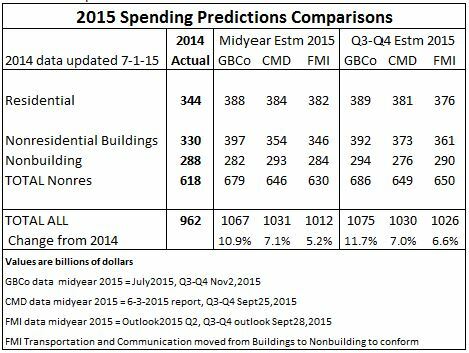 Here’s a comparison of projections for total construction spending in 2015. 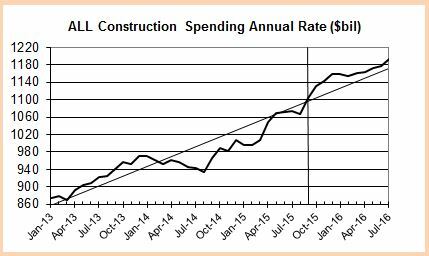 My numbers (GBCo) include the latest actual construction spending data released Nov. 2nd for September spending. This updated projection also includes revised future spending based on Dodge Data & Analytics construction starts released at the DDA Outlook 2016 conference Oct. 30th. My prediction for total spending in 2015, now at $1.075 trillion, hasn’t changed much (up 0.7%) since August. However, for next year my projection has increased from $1.150 to now expecting total spending of $1.190 trillion in 2016. The 2016 projection will be further refined in my year-end report. With the September spending values in the data, the statistical average predicted spending for 2015 is $1.073 trillion. My cash flow analysis by sector predicts 2015 will finish at $1.075 trillion. In 11 out of 14 years, the actual final value has been within 0.5% of the predicted. The statistical analysis gives a predicted range for total 2015 annual spending between $1.066 trillion and $1.086 trillion. The actual spending total has not fallen outside the statistical range since 2001, as far back as I’ve been tracking the data. Here’s a summary of predictions for several of the major markets. Again, my predictions from earlier in the year haven’t changed too much. In today’s data release from U.S. Census, spending for manufacturing buildings was lowered in both July and August, and September came in lower than I expected. That is the primary mover in the lower prediction for nonresidential buildings. Spending for manufacturing buildings is at an all-time high. Through September, spending on new manufacturing buildings has already reached an all-time annual high. 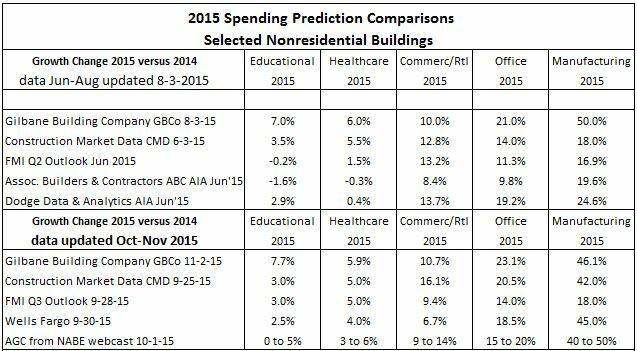 Manufacturing buildings helped 2015 spending for nonresidential buildings reach 19% growth but this won’t continue and I expect 2016 growth of 10%. Residential spending has been a nice surprise to the upside. The current rate of growth for the last 12 months is 17%/year and this rate of growth is expected to continue again in 2016. By edzarenski in Spending on November 2, 2015 .